You can navigate the exterior and interior of a model using any of three modes. When a model is opened, its newest saved Camera is active and the View panel is open on the left. If the model has no saved Cameras, a 3D Overview will initially be active instead. You can Hide the sidebar to maximize the view window. 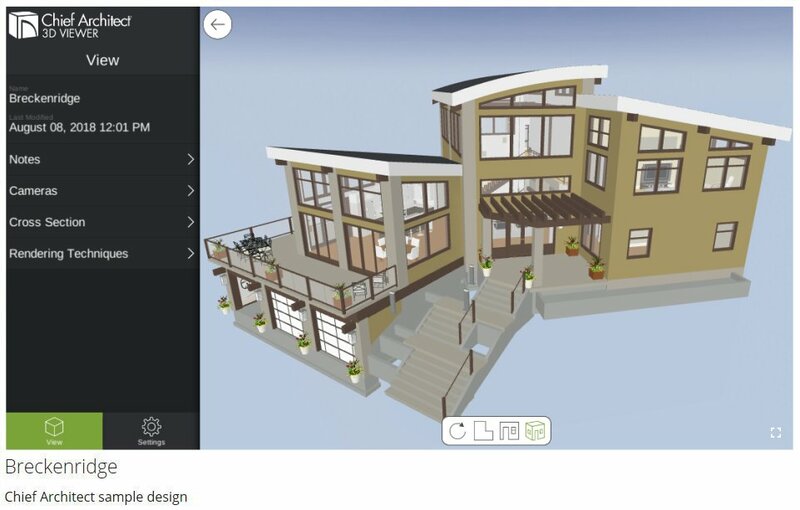 Tap the 3D Overview icon to enter an overview of the model's exterior. To navigate using a mouse, use the scroll wheel to pan and zoom, and click and drag to rotate around the model. Standard trackpad gestures can be used to zoom in and out as well as pan and rotate around the model. To reset the initial Overview camera position, click or tap the Restore icon. Click or tap the Room View icon to enable additional options for navigating the model's interior using Chief Architect® Sojourn®. 3D Viewer has three Rendering Techniques: Basic, Standard, and Glass House. Basic is the default mode and represents materials on object surfaces using solid colors. Standard displays photo-realistic textures such as wood grain on object surfaces as well as image objects like plants, but requires more memory. Glass House displays the model using semi-transparent surfaces and edge lines and also requires more resources than Basic rendering. You can switch between Rendering Techniques in the View menu. Depending on the size of the model, the app may need to switch back to Basic mode automatically. Tap the Information icon to the right of Glass House to set the surface Color and level of Transparency. Toggling Horizon Lines off can improve performance in Glass House mode. Shadows are not used in Glass House mode but can be toggled on or off in both Basic and Standard modes in Settings , under View. The Anti-Aliasing option improves the appearance of angled edge lines, but can be toggled off to improve 3D Viewer's performance in Settings , under View.